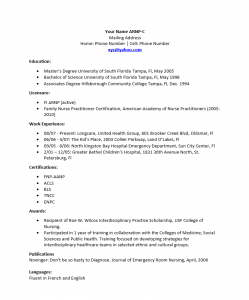 The Nurse Practitioner Resume Template can be an indispensable tool in a job hunting arsenal. Nurse Practitioners are nurses who have completed advanced training programs and must also have a masters since they are empowered to diagnose and treat common conditions, ailments, and diseases. 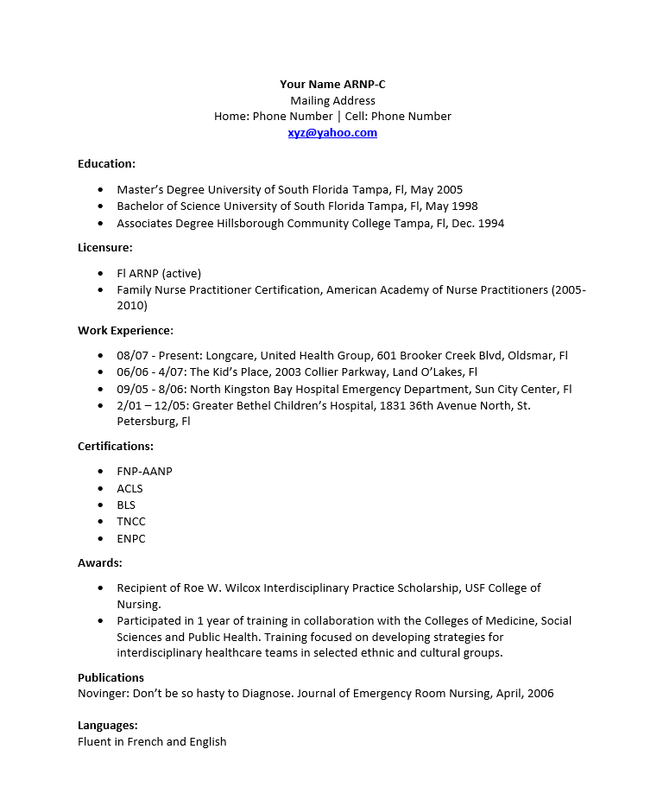 This means that a nurse practitioner resume absolutely must be a top notch quality document containing very definitive information. It must denote an understanding of everything from a basic knowledge of psychology to an advanced knowledge of medicine and must look perfect. The sections in the template for this resume will serve this purpose by dividing the impressive amount of information to be conveyed in a logical manner. In addition, the set format means that users need only fill out the content without worrying about common format issues such as alignment or font. While a job seeker can alter any part of the format, it is usually a good idea to make sure it remain consistent and professional. Each heading should have content which is well thought-out and accurate. A polished looking resume with high quality writing will usually attract attention to the candidate and is likely to result in a call back for an interview. Step 1. The top of the page is reserved for the candidate’s contact information. This consists of the full name and accurate contact information. Enter your full name on the top line with any suffix titles you may have. The following lines are for your mailing address, phone numbers and email. Step 2. The next two sections are for your credentials. In the “Education” section report on the degrees you hold, the name of the school where you earned them, the city and state of that school, and the year of graduation. The “Licensure” section should be where you list your license information. Give the each title of the license, its status, and the dates it is in effect. Step 3. Since this is a functional resume, the work experience section will be direct and concise. Here, report the date you worked for an employer, the name of that employer, and the location of that employer. Step 4. The “Certifications” section will be for any certificates you hold that pertain strictly to nursing. They can be listed in a brief fashion, however they should all be current or active. Step 6. The final sections are both optional but should be included if they apply. If you have been published anywhere list this under the heading “Publications.” If you possess any specifically helpful abilities (such as speaking a foreign language), report this in a separate section with an appropriate heading. In this example the heading is “Languages” and the applicant has listed what languages they speak along with the skill level they possess in communication.